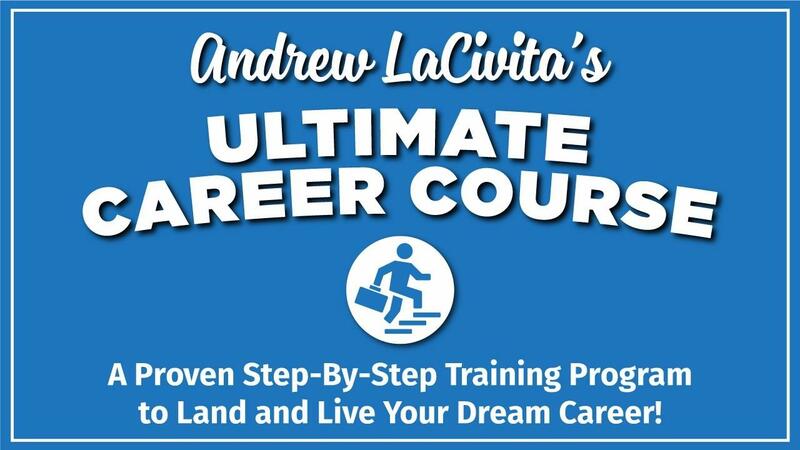 Enroll in The Ultimate Career Course Training and Coaching Program by Andrew LaCivita! This is a short recap of all the included material. Please review the full sales page for all the details, benefits, bonuses, previews, and frequently asked questions. 50 POWERFUL VIDEO AND 14 AUDIO TRAINING MODULES (VALUE: $497). These direct-to-camera training sessions help you learn everything you need to know to identify, find, and secure the right career for you. BONUS #1: AUDIO, WORKSHEET, AND EBOOK DOWNLOADS (VALUE: WHO KNOWS? ): Listen to the lessons on-the-go and take your mastery to the next level with the information-packed, helpful worksheets, guides, and eBooks that accompany these training modules. BONUS #2: 12 MONTHS OF ASK ANDREW COACHING (VALUE: $228): Attend live, monthly teaching and Q&A webcasts (live-casts), which will be recorded, and loaded into your portal so you never miss a lesson; view or review them at your leisure. BONUS #3: INTERVIEW INTERVENTION EXPERIENCE (VALUE: $27): Access the Interview Intervention eBook, audiobook, chapter notes, guides, and much more. This book has been downloaded or purchased by more than 95,000 people looking to improve their careers! BONUS #4: OUT OF REACH BUT IN SIGHT EXPERIENCE (VALUE: $17): Access the Out of Reach but in Sight eBook, audiobook, chapter notes, guides, and more to help you set and accomplish your goals! BONUS #5: ACCESS TO THE MILEWALK ACADEMY PRIVATE FACEBOOK GROUP (VALUE: PRICELESS! ): Ask questions and share insight with others in the community and take advantage of discount coupons I offer on additional future training because you’d be a repeat customer. ONGOING ACCESS TO US AND OTHER STUDENTS (VALUE: PRICELESS! ): A unique element to my training courses is direct interaction with me, my team, and other students via the training site. Comment, ask questions, and support others on a lesson-by-lesson basis. Get the help you need on the subjects you need it! LIFETIME ACCESS (VALUE: PRICELESS! ): Access your programs whenever you need them for however long you need them! I’m runnin’ out of breath here people! Register now to get immediate access to your training. You can watch at your own pace and your training is here for LIFE! 30-DAY MONEY BACK GUARANTEE! If you're not happy for any reason, contact us at [email protected] within 30 days for a full, no hassle refund! OUR FULL TERMS, PRIVACY, REFUND, AND DISCLAIMERS CAN BE LOCATED ON ALL PAGES OF THE MILEWALK ACADEMY SITE. PLEASE ACKNOWLEDGE YOUR ADHERENCE TO THEM. In addition, we believe in hard work. Our programs are designed to help you, but you must put in the effort. As stipulated by law, we can not and do not make any guarantees about your ability to get results. We don't know you and believe your results in life are up to you. We are willing to do everything we can to help you. That's our intention! Agreed? We just want to help by giving great content, direction and strategies that move you forward. Nothing on this page or any of our websites is a promise or guarantee of results or earnings, and we do not offer any legal, medical, tax or other professional advice. Any references to numbers, data, or other information referenced here, or on any of our sites, are simply estimates or projections. They should not be considered exact, actual or as a promise of potential results as all numbers are illustrative only. Many if not most students of educational programs - including perhaps our own - never use, open, or access their training or get results, and so your results cannot be estimated or guaranteed. As a reminder, all the terms, privacy policies and disclaimers for this program and website can be accessed on any of the site's pages. Thank you so much for reviewing this extra note. We can't wait to get engaged with you to help your growth!